Holman Bibles provides this extensive collection of study books that offers thorough but concise summaries and important information about the books of the Bible and Christian classics. - Publisher You grew up using the well known black and yellow striped Cliff's Notes to help you grasp everything from great literary works to algebra. Unfortunately, what ""Cliff"" forgot was the greatest literary work in history: the complete Holy Bible. Enjoy the ease of understanding the Bible like never before, book by book. Shepherd's notes helps reader's learn about the inspired authors of the Bible books and when and where they were first penned. Each Bible book is revealed in simple understandable steps that outline and underscore the focal points and personalities of the biblical text. You'll look to these unique books for their use in Bible studies, teaching, personal devotions and even in sermon preperation Christian and home schools will find Shepherd's Notes an invaluable resource. - Publisher One in a series of books comparable to Cliff's Notes. Here, each volume highlights the major points from one or more books of the Bible. 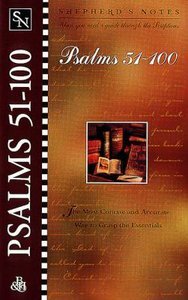 About "Psalms 51-100 (Shepherd's Notes Series)"
You grew up using the well known black and yellow striped Cliff's Notes to help you grasp everything from great literary works to algebra. Unfortunately, what ""Cliff"" forgot was the greatest literary work in history: the complete Holy Bible. Enjoy the ease of understanding the Bible like never before, book by book. Shepherd's notes helps reader's learn about the inspired authors of the Bible books and when and where they were first penned. Each Bible book is revealed in simple understandable steps that outline and underscore the focal points and personalities of the biblical text. You'll look to these unique books for their use in Bible studies, teaching, personal devotions and even in sermon preperation Christian and home schools will find Shepherd's Notes an invaluable resource. One in a series of books comparable to Cliff's Notes. Here, each volume highlights the major points from one or more books of the Bible.